1980s: Robert Silverman, the director of Harvard's Office of Planning,concludes that the University does not have enough room to grow in Cambridge and engineers a plan for Harvard to purchase land in Allston. 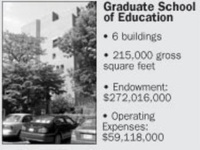 1987-1993: Harvard secretly purchases 52 acres of land in Allston. 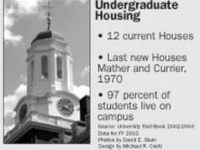 1999: A faculty planning committee recommends to the President and the Corporation that Allston be developed as a major new academic campus, rather than as an annex for non-essential University functions. September 1999: The faculty of Harvard Law School--viewed as a prime candidate for a cross-river move--votes overwhelmingly against moving to Allston. Summer 2000: Harvard purchases an additional 48 acres of land in Allston from the Massachusetts Turnpike Authority. October 2001: In his installation speech, University President Lawrence H. Summers names developing Allston as one his main goals. Winter 2002: A faculty planning committee settles on three scenarios for Allston. 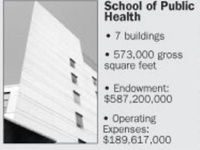 One option involves moving professional schools, including the law school; a second focuses on creating a science campus with possible commercial tie-ins; the third centers on cultural options. July 15, 2003: The University's deans and president hear a plan for Allston at their summer retreat. The plan calls for science and undergraduate housing, as well as Harvard's Graduate School of Education and School of Public Health, to move across the river. October 21, 2003: Summers sends a letter to Harvard faculty officially announcing his plan for Allston, ostensibly the same plan heard by the deans at their mid-summer retreat.